How to fix a motherboard without having to incur the cost of servicing – Everything starts from the service will surely culminate with the service as well . Well here is a suitable place for those who want to know about the science of courage , Dare to dismantle its own meaning … ! Many a wise man once said , why spend money if there is another way to free . for that this time I will try the simple knowledge that may indeed very necessary for the people or the friend who again confused with the motherboard which is often blank , the Dead themselves , even to not want Flash . Many once the incident occurred , I myself was often really experience it , knowing the joy, the second right puppy or used . I as the less able it is often trying new things yourself in case everything can be tricked … ! Without beating around and around in circles , let us consider just who knows the friend was in a hurry want to know the science of how … ! Here you need to know my friend is the first error that occurred on the motherboard mate , For Testing ! 1 . Ensure Power Supply Turns to normal and adequate electric power . 3 . Checks also all elco on the motherboard . How to Fix Motherboard Without Exit fare service , after completion in the normal checks and all , we live check components attached to the motherboard , the damage usually occurs in elco worn aka ‘m retired , check all elco , look at what there is swell or explode . If that happens , then my friend had to have a double knowledge Solder soldering! Replace elco which swell or burst , its size must be equal to the replaced let me not cause damage to other components . After all is completed , try again buddy motherboard , raft reinstall everything correctly and safely ! 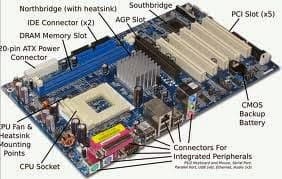 Buddy has become a service motherboard , this experience I have tried many times and passable now can fix the motherboard without having to pay service . Yeah … good luck ! I share this knowledge in order to benefit the electronics so that fellow fans can create new jobs for those who want to develop the science … !